You can use this page to book your tickets for the events shown below. Payment for tickets is by credit card. Please note that we use the secure online payment processing system called Stripe to process your credit card. We do not retain your credit card information. Please note that your tickets will be issued at the door before the performance i.e. tickets will not be posted to you. Your personal data will not be published. All personal data will be held by the Village Hall Committee and treated as confidential. It will be used only for the purpose of collecting payment and, if you agree, keeping you in touch with future events at the Village Hall. The After Hours Quintet has been thrilling audiences of all shapes and sizes, at festivals and fetes across the whole of Europe, with their red-hot jazz styles, since 2012. 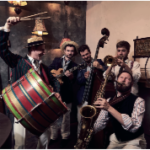 With a tantalisingly authentic repertoire spanning a hundred years (1900- 2018) the band display an almost ubiquitous appeal; bringing the sounds of the jazz age to life while reimagining modern material to sound - as swinging as any Speakeasy! Event starts at 7.30 pm. Doors open 6.45 pm. I would like to be kept in touch with future events by email. It would be really helpful to know how you heard about this event. Please tick all that apply. We use the payment system called Stripe to collect payment by credit card. Your credit card details will not be held by this website.